Company Overview - Yueqing Dod Electric Co., Ltd.
5YRSYueqing Dod Electric Co., Ltd.
YUEQING DOD ELECTRIC CO.,LTD is located in the China Electric Apparatus Capital of Liushi Town, which is on the coast of the East China Sea and at the World Geopark of Yandang Mountain's piedmont.Liushui Town is 40km north to Yandang Mountain, 30km southto Wenzhou Airport and near the East China Sea in the east, therefore the land,sea and air transportation here is very convenient.We are professional in producing series products of various types of power inverter, solar charge controller,solar system, wind system etc.Our company has strong technological strength, exquisite productiontechnology,as well as advanced and innovative production processes and equipments. 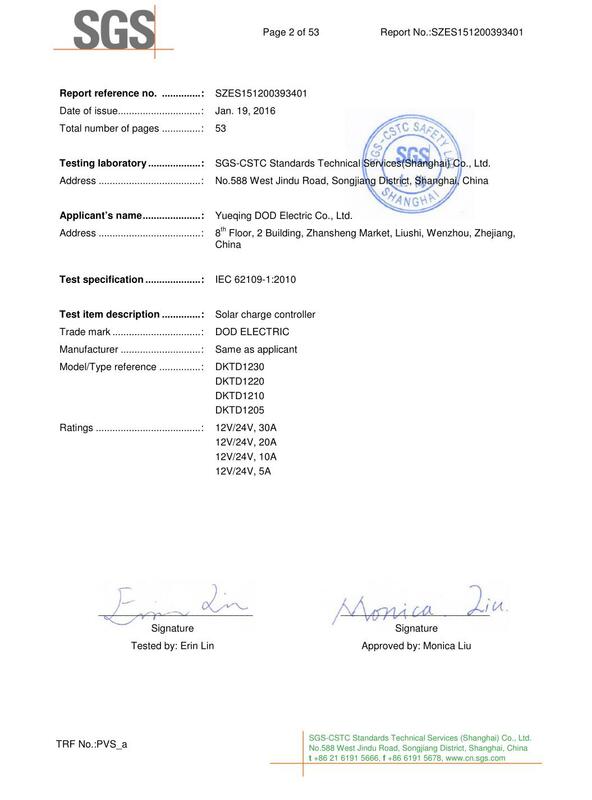 All of our products have obtained the certificate of conformity-from the National Institute of Measuring and Testing Technology .Science and technology constitute a primary productive force. 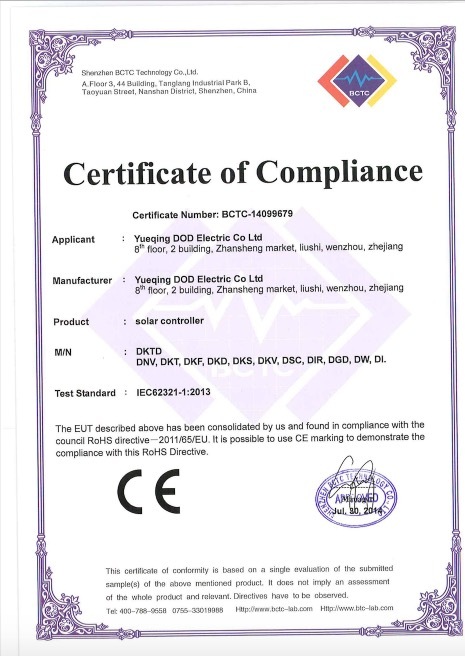 With over 30 national patents for invention,our company takes the lead in passing the ISO9001 Quality Management System certification, CE certification, explosion-proof certification,and RoHS environmental certification.Our company has set new product R&D center, and quality management department. We constantly release new products to take over the international markets.Providing customers with satisfactory products and good services, we are deeply welcomed by customers.Our products are exported to countries and regions including Southeast Asia, the Middle East, European countries and the America. enjoying a quite high international reputation.As the old saying goes that "it is necessary to have effective tools to do good work . " With the development of global power industry,new energy will play an important role. This is also the very mission and challenge faced by our company. "Be excellent today, and be prosperous in the future". 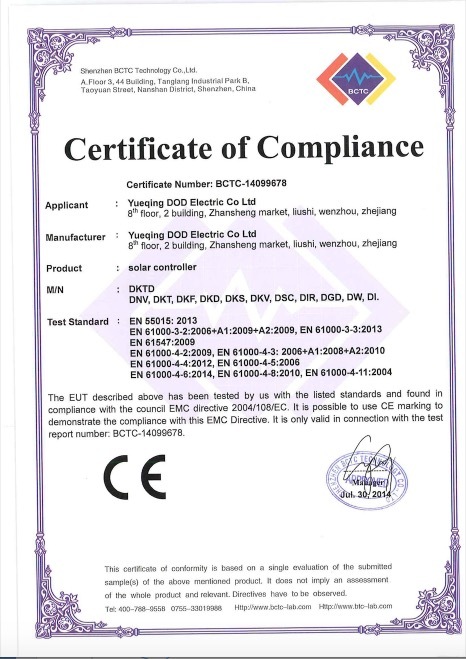 Based on the modern enterprise management system, with the spirit of an eagle striking the sky, DOD ELECTRIC CO., LTD will make unremitting efforts to become the top new energy in the world.